Are you growing tired from all the debates going on about increased air pollution due to relaxed environmental regulations? If so, you can always turn your attention to ocean pollution for a change of pace. There’s an estimated 320 million metric tons of plastic used annually, and unfortunately, 2.41 million metric tons end up in oceans. The improper disposal of this waste accumulates and ends up floating in our oceans and waterways, polluting the water as plastic breaks down — even killing marine wildlife and sea birds. 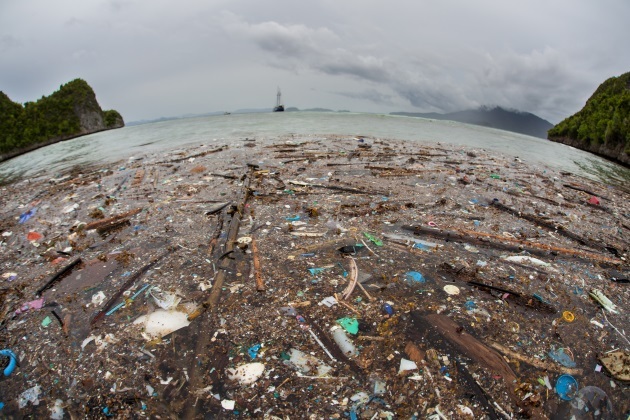 One notorious accumulation of floating trash can be found in the Pacific Ocean; The Great Pacific Patch is twice the size of the entire state of Texas, and it remains a great concern for many searching for solutions to the ocean plastics problem. Plenty of people have proposed solutions, and now a Dutch nonprofit has stepped forward to offer the most comprehensive cleanup yet. The Great Pacific Garbage Patch is really two great floating plastic piles comprised of about "an estimated 1.8 trillion pieces (80,000 tons by weight) of plastic garbage." Overall, there are about 5 trillion pieces of trash littering the world’s oceans, and the largest is between California and Hawaii. Ocean Cleanup is an organization started by a 24-year-old Dutch man, Boyan Slat. Slat had the idea to design a new solution to the ocean plastics problem, and he even gave a TED Talk about the subject. This is why a "2,000-foot-long plastic cleaning array, System 001" has been deployed in the San Francisco Bay under the Golden Gate Bridge. Slat’s organization raised an impressive $35 million in order to launch the project. Is the idea simple? According to The New York Times, the "boom detaches from the towing vessel, the current is expected to pull it into the shape of a ‘U.’ As it drifts along, propelled by the wind and waves, it should trap plastic ‘like Pac-Man’... The captured plastic would then be transported back to land, sorted and recycled." This contraption is designed to trap ocean plastics, pure and simple. The 10 feet of netting below the surface is supposedly capable of allowing fish to swim under it — capturing only floating plastic. Right now, it is undergoing two weeks of testing before its deployed further out in the Pacific by mid-October. This boom system, and dozens more to follow, could "clean up half of the Great Pacific Garbage Patch within the first five years. Each boom will trap up to 150,000 pounds of plastic per year as they float along the currents between California and Hawaii." Slat himself has some reservations about the project. One concern is that it may capture marine life along with plastic. Although the boom is designed not to trap fish, any structure in the sea is said to attract fish to it. There’s also the worry that given the unpredictable weather out at sea, like wind and waves, the boom may not even succeed in its general goal of collecting plastic. Another criticism is that this type of boom focuses on plastic after it has become trash. Other preventative measures, such as banning plastics like straws and bags in the first place, come to mind here. Smaller scale projects, like collecting trash in rivers instead, have been described as an alternative to such an expensive and risky project. This idea has been discussed for years, as Slat pitched the idea and raised the money from enthusiasts, whose donations included a 2014 crowdfunding campaign and other large sums. Now, supporters and critics have the chance to see if this will really work at removing plastic. This is, to date, the most comprehensive effort to clean the Pacific Patch up. If it works well enough, we will be seeing it pop up in more places, as time is running out for ocean pollution solutions.